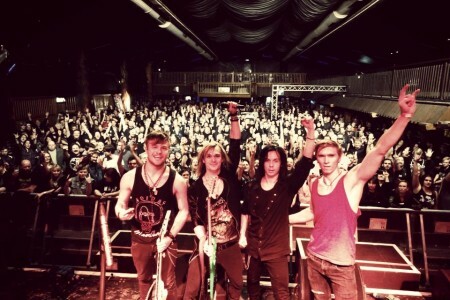 German rockers, Rebellious Spirit, have released a video for their song “Together” from their album Obsession, which was released in September 2014 to cap off the year. “A young metal band proving their skills! Or: youngsters turning out catchy, mature, energetic material! Whichever way you put it, the result definitely applies to Rebellious Spirit. The hard rock newcomer act from southern Germany, who caused a stir on the scene in 2013 with their debut Gamble Shot, are back again, presenting themselves as even more confident and accomplished on their second album Obsession. The four musicians Jannik Fischer (vocals, guitars), his brother Jens (bass), Silvio Bizer (drums) and Corvin Domhardt (guitar) have recorded twelve new tracks, a full dozen haunting rock numbers which document one thing first and foremost: this quartet has evolved to an amazing degree. 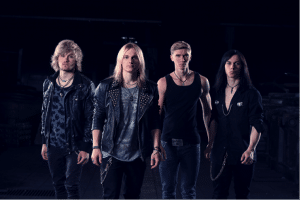 “The events of recent years, the production of our debut album Gamble Shot, the shows, the first tour with Axel Rudi Pell, all those things have helped us a great deal,” explains vocalist Jannik Fischer. He is referring to compositions such as the title track ‘Obsession’, a wild, almost unbridled midtempo number which sees Rebellious Spirit broach the issue of their experiences in the rock’n’roll industry. Jens Fischer comments: “A little obsession is so important! But mastering that tightrope walk without going crazy is the real achievement.” Having said that, their motto remains: obsession is the law! Their first single release ‘Lost’, a tough, sinister rock song with a quiet verse, a lot of bombast in its chorus and conscious references to Scandinavian acts such as Negative and HIM has turned into a thoroughly convincing number. Just how contemporary Rebellious Spirit have orchestrated their traditional rock sound becomes most evident on ‘Confidence Men’, which the band themselves refer to as “metal riff meets dance beat”, freely admitting to “traces of industrial rock on the side”. ‘Look What I’ve Become’ with its modern beginning and sinister post-grunge influences leaves an equally positive impression. Obsession was recorded at the Cubeaudio studios in Göttingen under the direction of Markus Gumball, who has worked for the likes of Guano Apes and Doro Pesch. Some months before, Gamble Shot had already been cut at Gumball’s hallowed halls, and this time around the producer and arranger found the band, which has gained enormously in terms of independence, imagination and skill, even more motivated. There can be no doubt: these young musicians offer an even broader range and have evidently benefitted from the countless concerts and festival appearances between the release of their debut recording and their work on Obsession. This band has come of age, and their twelve new songs can attest to that.